Which sums up what was going on in trying to get this picture and how fans of Sky Watch Friday see our patch of the sky. A film set has been erected in a local beach park for Voyage of the Dawn Treader and their dragon boat is impressive. In the interest of public safety, tall fences have been placed a good distance from the area meaning you can not get a photo of the full boat without a tree stuck up the middle and a half dozen pieces of equipment in the way. Watching the photography buffs climbing up trees and fences trying to get a better angle was pretty entertaining. 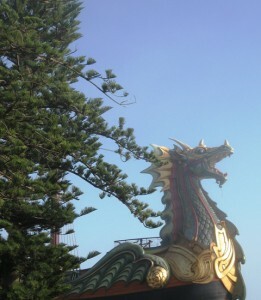 But then again, it is not every day you have a dragon floating by your beach or patch of sky. This would be fab to see up close and personal! I live 10 mins from this site. It is so amazing. Cant wait to see the movie. Very exciting and cool shot! I love the dragon… love the CS Lewis quote too! So true. Wow, was not expecting it to be so large. Isn&#39;t it neat to have a movie going on close by? What fun to get so close to a film set! The dragon is an attention getter. Too bad you couldn&#39;t get any closer but actually you got quite a good photo from far away. Thanks for posting this exotic photo. Mandy: That certainly is a flying dragon in your sky. what a wonderful dragon! And the beautiful blue of the sky is the perfect background. Wow, are you in the film? :)<br /><br />As always, you find the best combination of quote and image.<br /><br />Happy skywatching. I like that many of your posted photos include shots of the water. I wonder if you&#39;re drawn to it because of your Cape Cod experience. Growing up in Indiana I really had nothing to do with it but now feel I couldn&#39;t live without easy access to it, to view it, to be on it, to be in it. That is very cool! I also love that quote. So true! Mandy! A fun photo!! Enjoy your weekend trying to get ((the)) dragonboat photo!! What effort skywatchers go through to share their skies! Have a good weekend. Such a beautful dragon, great that you got so much of him for us to have a preview of the film. This is such a unique view! And I like the quote you chose for it, too!<br /><br />Thanks for visiting my blog and looking around.<br /><br />I&#39;ll be taking a tour of yours, now! Love your artwork! Those altered postcards are great! I&#39;m participating in an art swap and one has an Oriental theme. Yours gave me some ideas! Thanks. What a neat patch of sky you captured this week! Very magical. You&#39;ve made me so excited about the next movie. I wasn&#39;t sure when they began the series. I love the books so much, you see. Still. Maybe the fun movies are getting more people to read the wonderful books. what an amazing photo…that boat must be something to see in person…i love the chronicles of narnia movies…the books were among my favorite reads when i was younger…i can&#39;t wait to see the newest movie!!! Love it! You have a great site. Thanks for stopping by and leaving a note. Stop by when you can. I host 5 Things Friday if you care to stop by and play. Blessings. Love the dragon!! Would be great to see. How cool….not your everyday site, eh?<br /><br />My hubby was born in your neck of the woods! Thanks for stopping by my blog and for your very nice comment. Your pictures are beautiful.<br /> Have a good day. Yes you don&#39;t see many sea dragons now days.<br />brings back the magic. Leave a Reply to Baruch Click here to cancel reply.